West Ham suffered some terrible luck when £20.5 million club record signing, Andre Ayew, was seriously injured on his debut against Chelsea at the weekend. Ayew is expected to be out for four months, and West Ham are now considering whether to again dip into the transfer market for a striker. 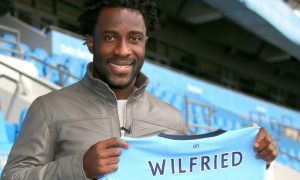 According to both the Mirror and Daily Mail today, a solution for the Hammers could be Manchester City striker Wilfried Bony. The 27-year-old is not in Pep Guardiola’s plans and hasn’t even made the bench for the opening two games of the season, with teenager Kelechi Iheanacho preferred. 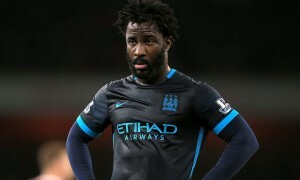 Bony has also been left out of City’s Champions League squad and appears to have no future at the Etihad. West Ham are said to be weighing up a move for Bony, who is a proven Premier League goal scorer, even if he has struggled to adapt to City’s playing style since joining the club for an initial fee of £25 million in January 2015. A recent report from the Independent stated that Pep Guardiola still wanted a goalkeeper and forward, if possible, before the transfer window closed. Shot-stopper Claudio Bravo looks to be on his way and the departure of Wilfried Bony could possibly open the door for another striker to join the Blues.